I just returned from a road trip to find that a friend of mine, the great Sixties-poster artist Gary Grimshaw, has died after a long illness. I am so sorry to hear this. I feel it is appropriate to say something about how important Grimshaw's work is (in my opinion) to the culture of the 1960s. As a well-known archivist of popular culture (founded All-Music Guide, All-Movie Guide, All-Game Guide, ClassicPosters.com, etc. ), I have studied and collected rock-concert posters for decades. I have met and interviewed many of the great 1960's rock-concert poster artists, and the ones I have not met or interviewed, I have studied their work with care. Not only have I collected many thousands of concert-rock posters myself, but I have gone to the trouble to personally photograph over 30,000 pieces of the finest rock-poster art. A few years ago I donated my collection of images, data, notes, articles, etc. to the Bentley Historical Library at the University of Michigan, so scholars of the future can research them. Of all the many concert-poster artists' works that I have seen, the single artist that has most affected me personally is the work of Gary Grimshaw. This is not to take away from the other artists, but rather just to say that to my mind (and taste) Grimshaw was a consummate artist of that time, a true voice and spirit of the 1960s. Although he lived for some time in the Bay Area, he hails from Michigan, where IMO he did most of his finest work. He not only produced what to my eyes is great art, but Grimshaw also contributed tirelessly to the community in innumerable ways. I have collected and photographed some 1,000 images of handbills, flyers, posters, and all kinds of other art that Grimshaw provided to the 1960s communities of both Ann Arbor and Detroit, not to mention San Francisco and the Bay Area. It is one thing to design posters for rock events, and quite another to produce hundreds and hundreds of items supporting every other kind of community project. To my knowledge, no other artist was as prolific, in particular when it comes to community support. Perhaps the concert-poster artist Randy Tuten comes close in sheer output. 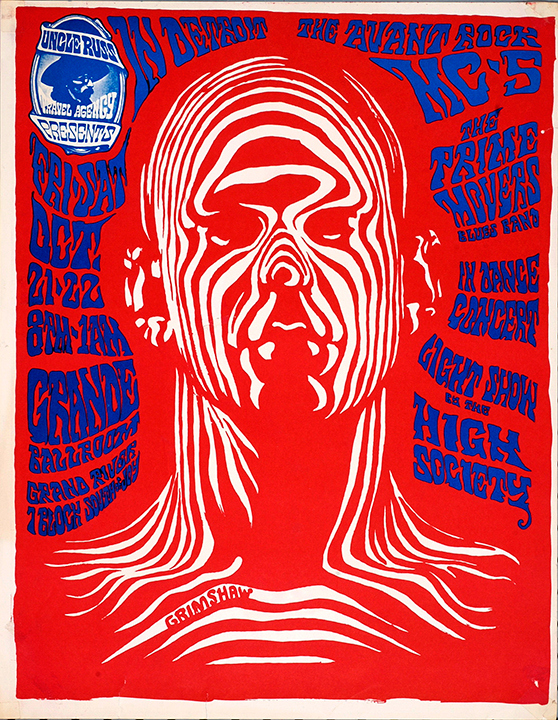 My own Sixties group, the Prime Movers Blues Band, appeared on several Grimshaw posters and flyers. I include one of them here with permission of Grimshaw's wife Laura, an heroic woman who tirelessly cared for Gary throughout his long illness. Although Grimshaw and I knew each other in the 1960s, it was only in later decades that we came to know one another more philosophically, in particular as I began collecting and working with his design legacy. I have written a short biography of Grimshaw (included below) and am preparing one of my audio interviews with Grimshaw as a video, which I will try to release and share soon. There will be what I imagine is a New-Orleans inspired funeral March this Sunday Jan. 19th starting at the Museum of Contemporary Art Detroit at 11 AM. For more details on this and events today, see this link. While I personally will miss Gary Grimshaw, I am certain that as time brings the Sixties epoch into final focus, the art world will discover Grimshaw's pure and seminal work to be as precious and timely as I have.